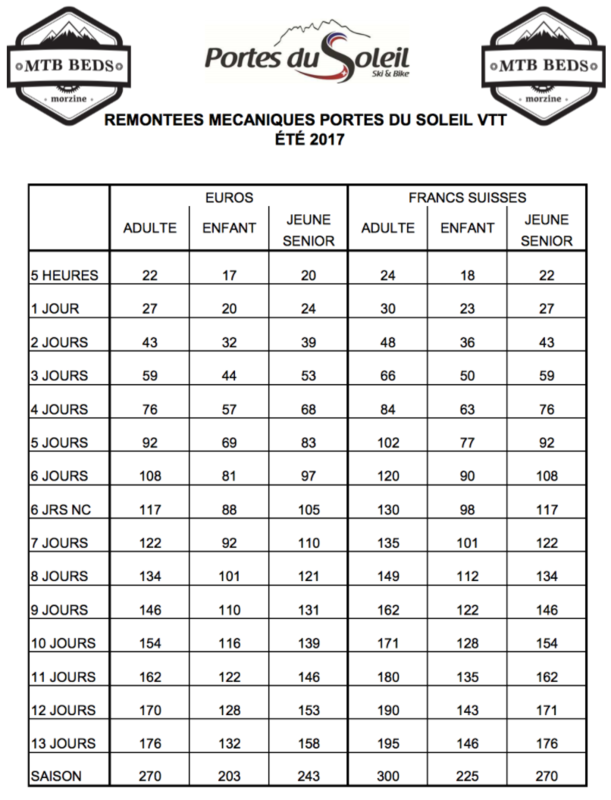 The World famous Morzine mountain bike resort and huge Portes du Soleil MTB area have released their 2017 summer lift pass prices and they are very similar to the 2016 prices, Brexit what..
take a look below at the chart, you can now also have non consecutive days on your pass, so if you come for a 2 week holiday you can ride any 6 days within 14. That's great. Morzine 2017 summer mountain bike lift pass prices, Facts and figure for Morzine 2017. If you want to get these booked ahead of your holiday to avoid the queues we will do it for you. Just drop us an email for how many people you would like and how long you would like a pass for. We will bring them with us for your check in where payment will be taken. We look forward to seeing you soon for some summer time shredding!